Interior of the Anaheim Train Station. This month long journey of historic Pittsburgh places is moving right along from planes (see yesterday’s post about the art deco style of the Allegheny County Airport) to trains. I am writing this post while riding Amtrak’s Pacific Surfliner in from Anaheim to just north of Los Angeles to meet a friend for dinner. I just sent a photo of the Anaheim Train Station to a friend and commented on how this transit hub really creates a great public space. 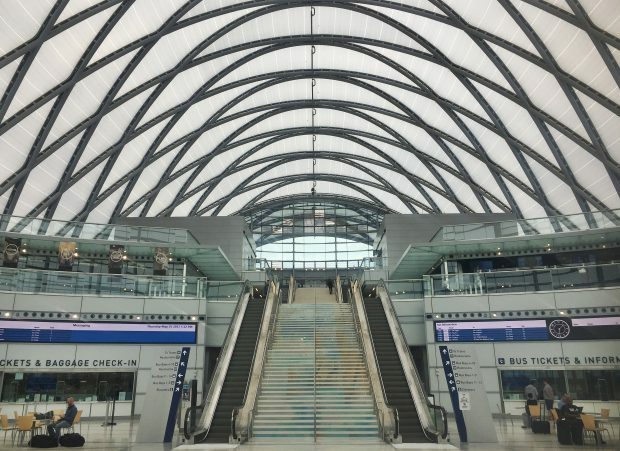 This was my first visit to the Anaheim Train Station, which is know as ARTIC, (Anaheim Regional Transportation Intermodal Center). ARTIC opened in 2014 and is just a block from the Angels stadium and the Honda Center, which is where the Anaheim Ducks hockey team plays. ARTIC is also close to both Disneyland and the Anaheim Convention Center. The Wilkinsburg train station, which no longer sits next to train tracks, but it conveniently located right next to the busway, is being restored and this building has the potential to be a great public space for connecting Pittsburgh and Wilkinsburg. 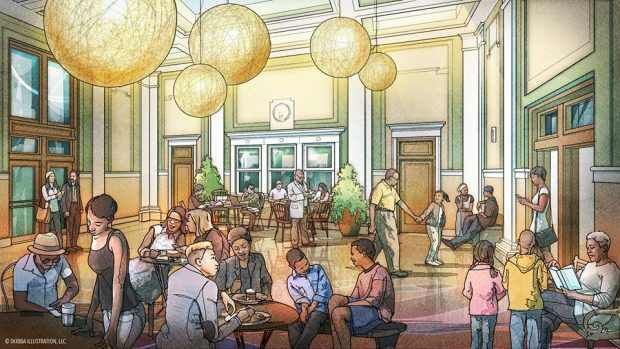 Rendering of proposed renovations to the Wilkinsburg Train Station. This is one of those projects that has been chugging along for quite some time and is just now picking up steam. The train station has not been used for train passengers since 1975. I would imagine that if it was possible to get on the train in Wilkinsburg today, it would be a popular stop. It is interesting to see how our transportation habits have changed overtime. According to a 2007 Tribune Review article, the first studies on repurposing the train station were done in 2004. Last year, the Wilkinsburg CDC has officially kicked off the fundraising for the restoration. After recieving a $1,000,000 grant from the Robert King Mellon Foundation, the Wilkinsburg CDC is working to raise the rest of the $3,000,000 for the renovation from private donations. The total projected cost for renovating the Wilkinsburg train station building is $3,000,000. The Richard King Mellon Foundation donated the first $1 million and the Wilkinsburg CDC is looking to raise the rest of the money from individuals and other private foundations. Several fundraising events have already been held and I am sure there will be more opportunities to support this project. Detail of portico of Wilkinsburg Train Station, October 2016. Wilkinsburg Train Station, October 2016. It was the arrival of the train to Wilkinsburg that led to the expansion of the area as a suburb to the City of Pittsburgh. For more post cards of the current and previous Wilkinsburg train stations visit this page on the Wilkinsburg Historical Society website. For more photos and newsclippings about the Wilkinsburg train station, see the album, “A History of Wilkinsburg Station,” on the Wilkinsburg Train Station Facebook page. Postmarked 10/13/1917. Credit Wilkinsburg Historical Society Website. 1851 – The Pennsylvania Railroad comes through the village of Wilkinsburg. 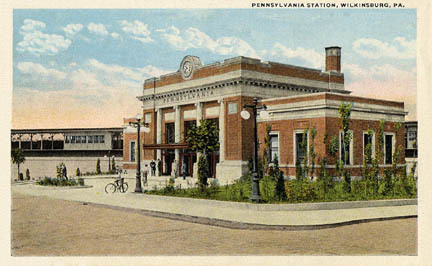 1916 – Wilkinsburg Train Station opens in current location, two previous stations had been located a few blocks away. This station serviced trains on the Pennsylvania Railroad. 1963 – East Liberty train station was demolished, Wilkinsburg train station was used as a stop for both East Liberty and Wilkinsburg. 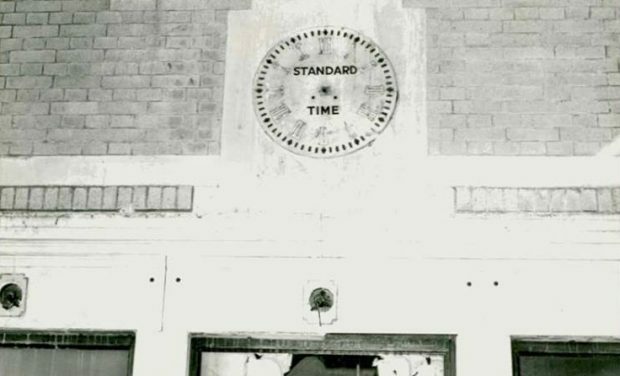 Clock on the wall of the Wilkinsburg Train Station. Interior photos from the Wilkinsburg Train Station Facebook page. 1971 – Amtrak took over the passenger service. 3 of the 4 passenger train routes that made stops in Wilkinsburg were discontinued. 1975 – Amtrak discontinued the stop, only 128 people had used the stop in the first 6 months of the year. 1981 – The Parkway Limited train provided brief service to Wilkinsburg, but did not use the train station building. 1985 – The Wilkinsburg Train Station is added to the National Register of Historic Places. 2016 – October 5, 2016 – Wilkinsburg CDC hosts public kickoff event for train station restoration project. Follow the Wilkinsburg Train Station Restoration Project on Facebook.